1 Spray 5- to 6-quart slow cooker with cooking spray. Mix beans, onions, bell pepper, Italian seasoning, 1 tablespoon of the oil and 1 teaspoon of the salt in slow cooker. 2 Rub pork loin with remaining 1 tablespoon oil, then rub in remaining 1 teaspoon salt. Heat 12-inch nonstick skillet over medium-high heat. Cook pork in hot skillet 3 to 5 minutes on both large flat sides or until browned. Transfer to slow cooker. Pour tomatoes over pork. Cover; cook on Low heat setting 3 to 4 hours or until pork is cooked through (145°F in center). 3 Transfer pork to cutting board; let stand until cool enough to handle. Stir bean mixture in slow cooker; using slotted spoon, transfer to serving platter. 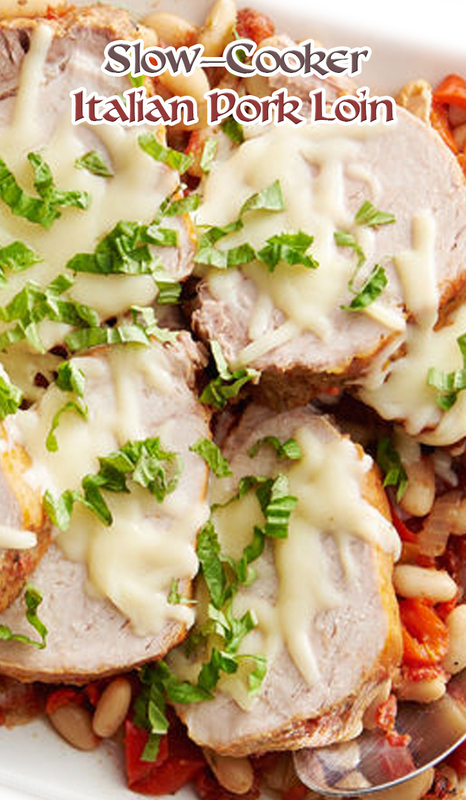 Cut pork into 8 slices; place on top of bean mixture on platter, then top with mozzarella cheese. Cover platter with foil 3 to 5 minutes or until cheese melts. Remove foil; top with basil.